Some users have found issues with the recently launched version 1.3.0. Since I have no way to answer Google Play's comments (only selected publishers can) I'm replying in this post. Some Android 4.x devices inform incorrect sizes for the 3x2 widget, and in some cases for both 3x2 and 4x3. 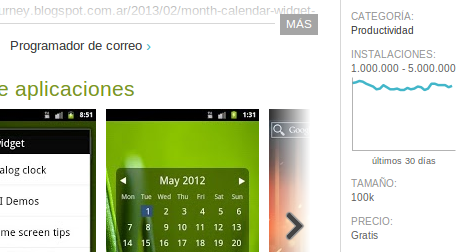 For example, some users are seeing a 3x3 label for the 3x2 widget in the list of available widgets. There is a way to get rid of the icon in applications drawer, but I found that doing so brings problems when trying to reinstall the application. So I decided to keep it there. I'm doing an extensive research right now to solve the first issue. I'll report back here when I fid a solution. EDIT March 6th: Version 1.3.1 is now on Google Play. Size issues fixed for Android 4.x users.